This article was written for the February 2002 issue of Home Toys. Listeners may hear sounds that are not actually on a record. Recording engineers can trick the ear into hearing sounds beyond what is recorded. The room can also cancel sounds that are actually on the record. The term “Bass trap” is counterintuitive, since preventing bass reflections stops their cancellation by the room. Copyright © 2002 by Acoustics First Corporation and Home Toys, Inc.
How is this possible? I think the word is psycho-acoustics. Knowing the odds were good that the record would be played back on a big but restricted bandwidth system, I cut the bass off at 80 Hz with an 18 dB per octave filter. (There's no point in filling bandwidth that won’t be heard.) 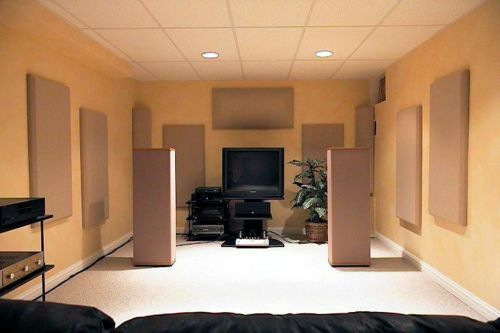 To offset this, the range around 100 – 120 Hz got a big boost. The listener recognized there was a bass player and a bass drum and the listener’s ear and brain created the fundamental frequencies from their multiples. Low cost analyzers, used to set third octave equalizer-filters were becoming available by then, so I took one with me and head back to the station. Sure enough one room was “River Deep” and the other was “Mountain High” at the same frequency by 6 dB. That’s a 12 point spread in one direction or the other depending upon where the recording originates and where it plays back! The reason is this room dimensions. If a wall, or other boundary surface, is one half wavelength away from the source of the sound, it will see its reflection out-of-phase and cancel. For 40 Hz this is approximately 14 feet. There will be similar effects on multiples of that fundamental frequency. A boost with electronics will also serve to boost the out-of-phase reflection by and equal amount. It’s a zero-sum game. The solution is a bass trap. A bass trap needs to be big since the bass waves are big. One of the most effective traps is the polycylindrical diffuser. These are large curved surfaces, bowed out from the wall at their center. The center frequency of absorption is dependent primarily upon the surface size. A four-foot by ten- foot piece of Masonite®, or other flexible material, bent to form a “poly” absorbs everything around 40 Hz. Similarly, four by eight’s get 63 Hz, two by four’s; 125 Hz and so forth. These devices appear as open windows to the bass. Of course, an alternative is to open the window but this requires understanding neighbors, preferably miles away. Long waves “cycle” far down the road! If you are old enough to remember Elvis in New York, you may have seen polycylindricals on the wall of the RCA studios where “Hound Dog” was recorded. They are also still prominent on the movie scoring stage. 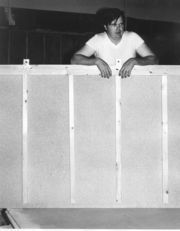 Now made of fiberglass and easier to obtain and install, without hand building, these devices are making a comeback in auditoriums and theater applications. 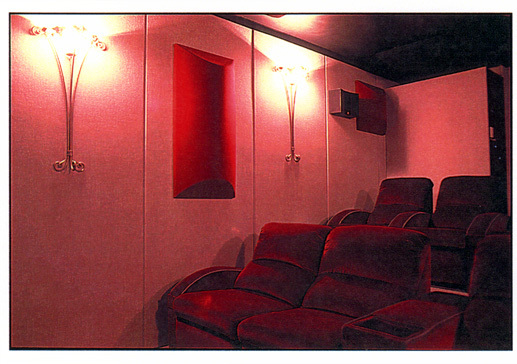 Polycylindrical Diffuser above the screen in Home Theater. 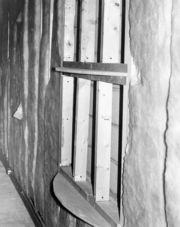 Custom unit built into the wall by the author in 1971. Alpha Audio Studios photo. 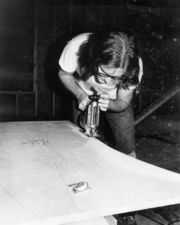 Engineer (Joe Sheets) cutting polycylinder forms. The author resting on a piece of a floating floor after installing polys.